Between 11 – 48% of all surgical patients suffer from anaemia prior to surgery (1). Following the definition of the WHO, women with a haemoglobin (Hb)-level <12 g/dl and men with an Hb-level <13 g/dl have an insufficient haemoglobin count, thus being anaemic. If undiagnosed and eventually untreated, preoperative anaemia is likely to dramatically affect patient outcome. In fact, preoperative anaemia is an independent factor risk for an increased morbidity, mortality as well as length of stay (2-7). Furthermore, preoperative anaemia represents a major indicator for coming into need of allogenic red blood cell (RBC) transfusions (8). RBC transfusions mark an important and lifesaving therapy option during specific medical settings, such as massive haemorrhage following polytrauma. However, as with any other medication, transfusing allogenic RBC is associated with potential side effects, such as transfusion associated circulatory overload (TACO), hypothermia, hyperkalaemia, hypercalcaemia, transfusion haemosiderosis, allergic transfusion reactions, haemolytic transfusion reactions, (febrile) non-haemolytic transfusion reactions, transfusion associated acute lung injury (TRALI) or transfusion associated graft versus host disease (9). Furthermore, a potential association between a higher number of RBC transfusions and an increased morbidity has recently been suggested by retrospective studies. In fact, a single study reports that even the transfusion of only one RBC is associated with increasing odds of ischemic strokes and/or myocardial infarctions as well as a prolonged length of stay (10). Additionally, there is an ongoing discussion if RBC transfusions might be associated with tumour recurrence in cancer patients (11, 12). Eventually and despite ever increasing quality standards, an unintended transfusion of the wrong blood type or the infection with a (yet unknown) virus cannot be excluded. Besides low preoperative Hb-levels, (unnecessary) perioperative blood losses, for instance because of the intervention itself, coagulopathy or phlebotomy can further increase transfusion requirements and thus odds of patients being exposed to potential risks of RBC. Taking the potential risks as well as decreasing blood resources due to a demographic shift into consideration, reviewing prevailing national and international transfusion routines is a task long overdue. For instance, in a recent study, patients with matchable risk profile treated in different hospital for the same intervention were demonstrated to receive a strongly diverging number of RBC (8). This is surprising, as the application of RBC in many countries, eg, Germany, is regulated by guidelines published by respective medical societies or governmental institutions (13). On the international scale, a comparison of the number of RBC transfused per 1000 population in different countries likewise revealed large differences (eg, Germany = 54.6 RBC per 1000 population vs. Netherlands = 27.0 RBC per 1000 population) (14). If we continue the “irrational” use of our blood resources we not only expose patients to unnecessary risks, consequently providing sub-standard care, but we might also find ourselves in situations where RBC are indicated but simply not available in the not so far future. Patient Blood Management (PBM) is an interdisciplinary, patient-centred clinical maxim, encountering the challenges above to increase patient safety. PBM as a concept comprises a large number of different measures, which can be tailored-fit to meet the specific needs of individual patients, urging a renunciation of the antiquated “one-size-fits-all” approach. Thus, it is not blood products framing the focus of therapy options, but the individual patient needs as well as the various PBM measures, which can be assigned to three main aspects, the three sustaining pillars of PBM. Preoperative anaemia represents a large risk factor for peri-operatively coming into need of an allogenic RBC as well as a worsened outcome for approximately one third of patients undergoing surgery. Massive intraoperative blood losses unquestionable result in a further escalation of both risk factors. Thus, diagnosing and (if indicated) correcting preoperative anaemia should be mandatory ahead of planned surgeries with an expected blood loss >500 ml or a transfusion probability >10%. Beside chronic diseases (approx. 40%; eg, chronic inflammation, tumours, autoimmune diseases, kidney insufficiency), iron deficiency is one of the major causes of preoperative anaemia, affecting approximately one-third of the surgical patient population (15). For diagnosing as well as for guiding the correction of preoperative anaemia, only a few blood values are need (eg, transferrin saturation, ferritin, soluble transferrin receptor), which partially are already assessed in clinical routine. Whereas a treatment for anaemia of chronic disease is hardly feasible preoperatively, correcting iron deficiency anaemia is a relatively straight forward process, likely being effective even within a restricted period of time. In consequence, but also due to the high incidence rate, current studies and guideline focus on a correction of the latter (16-19). With the usually relatively short time period between diagnosis and surgery, treatment of iron deficiency using oral iron products is ineffective regarding a timely substitution of empty iron stores, making a parenteral iron substitution the favourable medication in most settings. In order to achieve the best possible treatment outcome, in other words to maximise the increase of Hb-levels, treatment should be conducted between two to four weeks prior to surgery (20). However, a shorter time period, for instance due to logistics, is no reason to refrain from treatment. In fact, substituting iron parenterally just a few days ahead of surgery, possibly even postoperatively was demonstrated to significantly increase Hb-levels 4 weeks after surgery as well as to improve patient outcome (21, 22). However, the more desirable approach would be postponing the intervention until the patient is prepared in the best possible way, an approach that should be discussed with the patient as well as with the leading medical team. With waiting times of up to 4 to 8 weeks, especially in non-cancer surgery, abandoning the opportunity to manage a confirmed iron deficiency anaemia preoperatively in exchange to falling back onto allogenic blood transfusions, is a behaviour that should not only be questioned from medical, but also from ethical and legal perspectives. Implementing an anaemia walk-in clinic is helpful to centralise tasks associated with a timely management of preoperative anaemia. A visit to the walk-in clinic might be made part of clinical routine, for instance following pre-operation discussion or premedication. Thereby, clinical departments (eg, surgery, anaesthesiology) are not burdened with extra workload. Management can be simplified by making use of standard operating procedures or algorithms in which thresholds for diagnosis and treatment are depicted (figure 1). To prevent iatrogenic anaemia as well as potentially associated allogenic blood transfusions, it is of paramount importance to minimise the number of unnecessary blood drawings as well as to maximise the use of blood conserving measures. 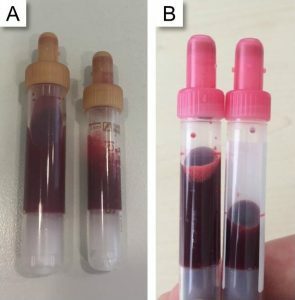 Figure 2: Reduced blood phlebotomy related blood losses because of (A) smaller blood tubes or (B) reduced filling level. Preoperatively, standardized operating procedures allow for a timely identification of a potential coagulopathy and thus to prevent intraoperative blood losses. Special attention needs to be paid to an adequate periinterventional management of an active anticoagulation (eg, NOAKs, antiplatelet drugs). Perioperatively, yet most severely when admitted to the intensive care unit, diagnostic blood drawings can significantly reduce patient’s blood volume, eventually resulting in hospital-acquired anaemia. Thus, frequency and routine of blood drawings should be adjusted to fit individual patient needs. In addition, the capacity of blood tubes should be reduced to the smallest volume needed (alternative: reduced filling level) for exact analyses (figure 2). Likewise, discards during blood drawings need to be minimised, for instance by making use of closed in-line flush sampling devices. Minimising intraoperative blood losses makes the application of modern surgical techniques such as minimal invasive methods highly important. Nevertheless, managing coagulation, for instance by keeping essential physiological parameters (eg, body temperature, ionized calcium, pH-value) stable is of equal importance. Whenever possible, monitoring as well as managing the correction of a coagulopathy using factor concentrates should be supported by point-of-care testing. (23). In case of a blood loss >500 ml, cell salvaging, which describes the process of collecting, washing and retransfusing autologous blood, is a powerful tool to minimise the need for allogenic RBC (24). Figure 3: Checklist of transfusions triggers currently in use at the University Hospital Frankfurt. Ensuring a sufficient global oxygen supply to minimise risks associated with acute anaemia marks the primary goal of an allogenic RBC. With RBC being associated with potential side effects, risks of allogenic blood and acute anaemia should be balanced for the individual patient Prior to transfusion. 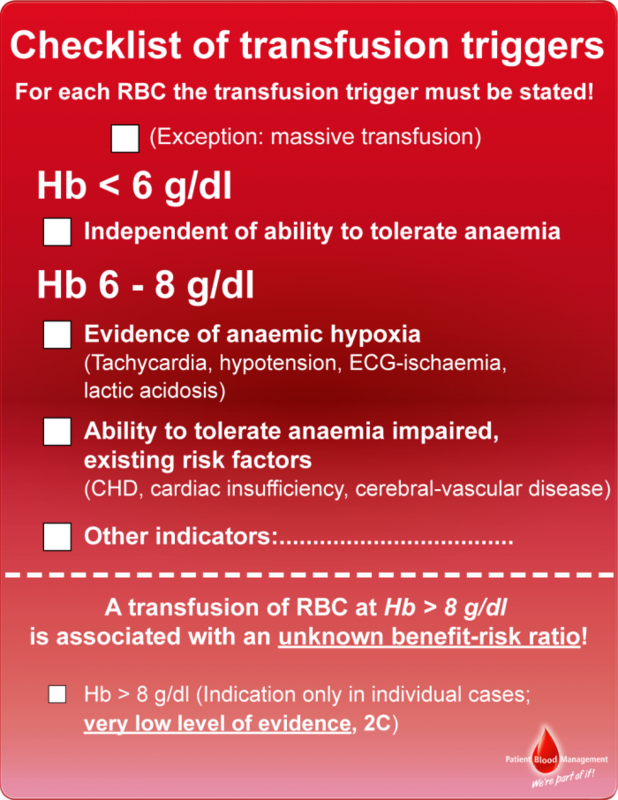 A thorough assessment however is not based solely on Hb-levels, but takes further parameters, such as patient individual anaemia tolerance, the acute condition as well as physiological transfusion triggers (eg, central venous oxygen saturation <60%) into consideration (13). Patients with normal cardiovascular functions can often compensate low Hb-levels (6 to 8 g/dl). In fact, despite the large number of studies, a liberal transfusion strategy (target Hb-level: 9-11 g/dl) was not advantageous compared to a more restrictive transfusions strategy (target Hb-level: 7-9 g/dl) in most medical settings (25-28). Yet, regarding cardiovascular high-risk, geriatric or oncological patients, the adequate transfusions strategy is a matter of ongoing scientific debates. Generally speaking, due to the potential side effects, allogenic blood transfusions should always be considered the “ultimate ratio” to treat anaemia (29). Analogous or digital checklists, providing information on transfusion triggers, are simple but effective means to support physicians during the everyday process of decision-making (30) (figure 3). Munoz M, Gomez-Ramirez S, Campos A, Ruiz J, Liumbruno GM. Pre-operative anaemia: prevalence, consequences and approaches to management. Blood transfusion. 2015;13(3):370-9. Baron DM, Hochrieser H, Posch M, Metnitz B, Rhodes A, Moreno RP, et al. Preoperative anaemia is associated with poor clinical outcome in non-cardiac surgery patients. British Journal of Anaesthesia. 2014;113(3):416-23. Klein AA, Collier TJ, Brar MS, Evans C, Hallward G, Fletcher SN, et al. The incidence and importance of anaemia in patients undergoing cardiac surgery in the UK – the first Association of Cardiothoracic Anaesthetists national audit. Anaesthesia. 2016;71(6):627-35. Musallam KM, Tamim HM, Richards T, Spahn DR, Rosendaal FR, Habbal A, et al. Preoperative anaemia and postoperative outcomes in non-cardiac surgery: a retrospective cohort study. The Lancet. 2011;378(9800):1396-407. Carson JL, Duff A, Poses RM, Berlin JA, Spence RK, Trout R, et al. Effect of anaemia and cardiovascular disease on surgical mortality and morbidity. The Lancet. 1996;348(9034):1055-60. Leichtle SW, Mouawad NJ, Lampman R, Singal B, Cleary RK. Does preoperative anemia adversely affect colon and rectal surgery outcomes? Journal of the American College of Surgeons. 2011;212(2):187-94.
von Heymann C, Kaufner L, Sander M, Spies C, Schmidt K, Gombotz H, et al. Does the severity of preoperative anemia or blood transfusion have a stronger impact on long-term survival after cardiac surgery? The Journal of Thoracic and Cardiovascular Surgery. 2016;152(5):1412-20. Gombotz H, Rehak PH, Shander A, Hofmann A. Blood use in elective surgery: the Austrian benchmark study. Transfusion. 2007;47(8):1468-80. Delaney M, Wendel S, Bercovitz RS, Cid J, Cohn C, Dunbar NM, et al. Transfusion reactions: prevention, diagnosis, and treatment. The Lancet. 2016;388(10061):2825-36. Whitlock EL, Kim H, Auerbach AD. Harms associated with single unit perioperative transfusion: retrospective population based analysis. BMJ. 2015;350:h3037. Acheson AG, Brookes MJ, Spahn DR. Effects of Allogeneic Red Blood Cell Transfusions on Clinical Outcomes in Patients Undergoing Colorectal Cancer Surgery: A Systematic Review and Meta-Analysis. Annals of Surgery. 2012;256(2):235-44. Horowitz M, Neeman E, Sharon E, Ben-Eliyahu S. Exploiting the critical perioperative period to improve long-term cancer outcomes. Nature reviews Clinical oncology. 2015;12(4):213-26. Vorstand der Bundesärztekammer auf Empfehlung des Wissenschaftlichen Beirats. Querschnitts-Leitlinien (BÄK) zur Therapie mit Blutkomponenten und Plasmaderivaten. 2014;4. überarbeitete Auflage. Carson JL, Triulzi DJ, Ness PM. Indications for and Adverse Effects of Red-Cell Transfusion. The New England journal of medicine. 2017;377(13):1261-72. Camaschella C. Iron-deficiency anemia. The New England journal of medicine. 2015;372(19):1832-43. Meybohm P, Muller MM, Zacharowski K. [Preoperative Preparation: Patient Blood Management – What is Optimal?]. Anästhesiologie, Intensivmedizin, Notfallmedizin und Schmerztherapie. 2017;52(5):326-40. Munoz M, Acheson AG, Auerbach M, Besser M, Habler O, Kehlet H, et al. 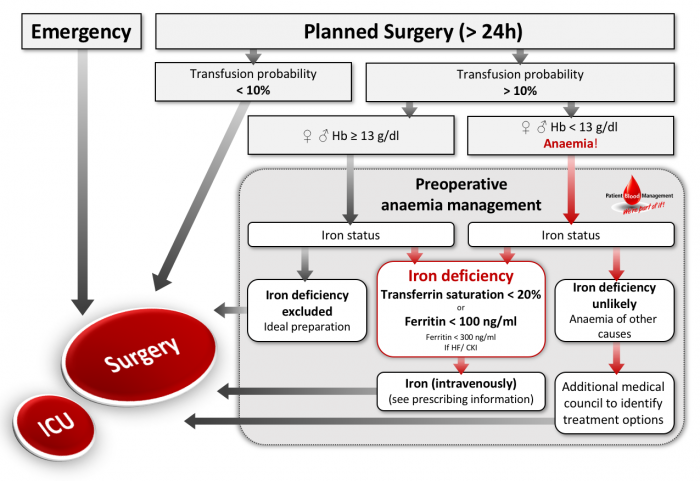 International consensus statement on the peri-operative management of anaemia and iron deficiency. Anaesthesia. 2017;72(2):233-47. National Blood Association Australia. Patient Blood Management Guidelines. [Accessed: 17.08.2017]. Available from: https://www.blood.gov.au/pbm-guidelines. National Institute for Health and Care Excellence. Blood transfusion – Quality standard 138. 2016 [Accessed: 17.08.2017]. Available from: https://www.nice.org.uk/guidance/qs138. Froessler B, Palm P, Weber I, Hodyl NA, Singh R, Murphy EM. The Important Role for Intravenous Iron in Perioperative Patient Blood Management in Major Abdominal Surgery: A Randomized Controlled Trial. Annals of Surgery. 2016;264(1):41-6. Meybohm P, Goehring MH, Choorapoikayil S, Fischer D, Rey J, Herrmann E, et al. Feasibility and efficiency of a preoperative anaemia walk-in clinic: secondary data from a prospective observational trial. British Journal of Anaesthesia. 2017;118(4):625-6. Khalafallah AA, Yan C, Al-Badri R, Robinson E, Kirkby BE, Ingram E, et al. Intravenous ferric carboxymaltose versus standard care in the management of postoperative anaemia: a prospective, open-label, randomised controlled trial. The Lancet Haematology. 2016;3(9):e415-25. Weber CF, Gorlinger K, Meininger D, Herrmann E, Bingold T, Moritz A, et al. Point-of-care testing: a prospective, randomized clinical trial of efficacy in coagulopathic cardiac surgery patients. Anesthesiology. 2012;117(3):531-47. Meybohm P, Choorapoikayil S, Wessels A, Herrmann E, Zacharowski K, Spahn DR. Washed cell salvage in surgical patients: A review and meta-analysis of prospective randomized trials under PRISMA. Medicine. 2016;95(31):e4490. Brunskill SJ, Millette SL, Shokoohi A, Pulford EC, Doree C, Murphy MF, et al. Red blood cell transfusion for people undergoing hip fracture surgery. Cochrane Database of Systematic Reviews. 2015(4):CD009699. Carson JL, Sieber F, Cook DR, Hoover DR, Noveck H, Chaitman BR, et al. Liberal versus restrictive blood transfusion strategy: 3-year survival and cause of death results from the FOCUS randomised controlled trial. Lancet. 2015;385(9974):1183-9. Carson JL, Terrin ML, Noveck H, Sanders DW, Chaitman BR, Rhoads GG, et al. Liberal or restrictive transfusion in high-risk patients after hip surgery. The New England journal of medicine. 2011;365(26):2453-62. Simon GI, Craswell A, Thom O, Fung YL. Outcomes of restrictive versus liberal transfusion strategies in older adults from nine randomised controlled trials: a systematic review and meta-analysis. The Lancet Haematology. 2017;4(10):e465-e74. Goodnough LT, Shieh L, Hadhazy E, Cheng N, Khari P, Maggio P. Improved blood utilization using real-time clinical decision support. Transfusion. 2014;54(5):1358-65.